Today My Sweet Petunia is meeting up with Ink Blot Shop for some fun, and yes we have some prizes. 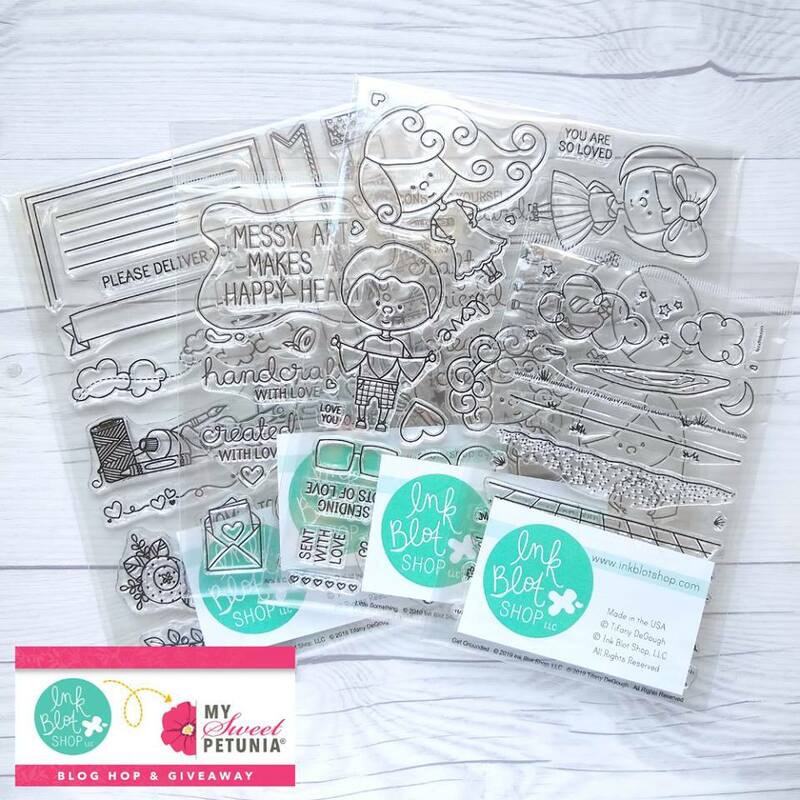 From My Sweet Petunia we have the following for one lucky winner drawn from the comments you leave on the blogs. 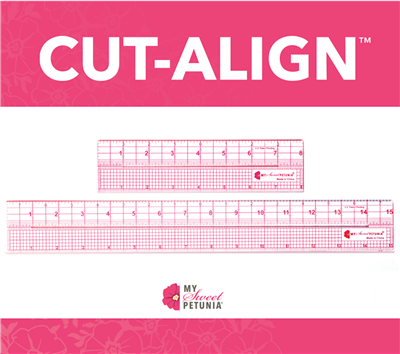 and one of the new Cut-Align. And from Ink Blot Shop this wonderful package to one lucky winner who leaves a comment. Now back to the card I made for today. 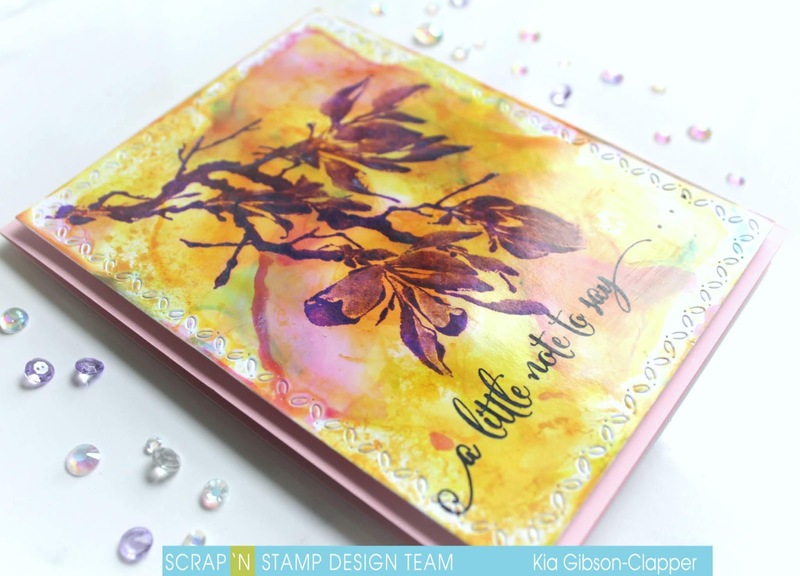 I am using stamps from the latest release, being Get Grounded and Botanical Borders. 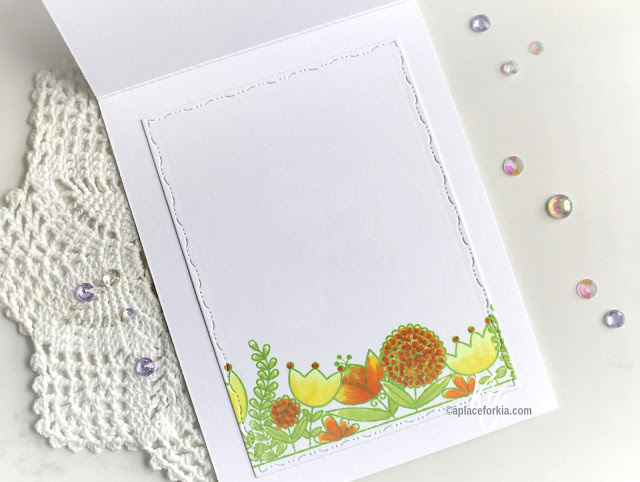 The Botanical Borders have 3 borders of floral stamps and a stamp of leaves. 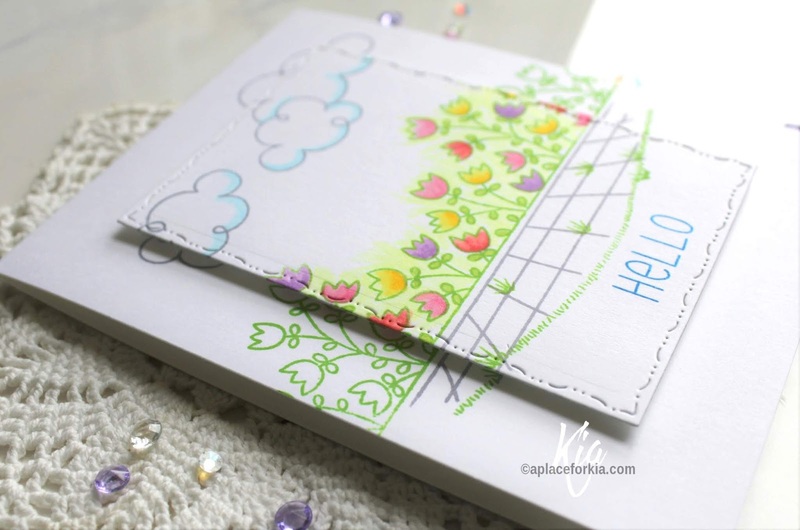 I am using two of the floral borders for my card, one on the outside and one inside. In my Original Misti I stamped the layers on both my card base and my die cut panel, using Ranger Vivid Chartreuse along with Shadow Grey for stone walkway. I coloured using Copic Markers in various colours and used a Yellow Green for the background. The die is from Penny Black called Elegant Stitching. Below is the inside coloured in yellows and oranges. I very much enjoyed these two sets that work so wonderfully together. 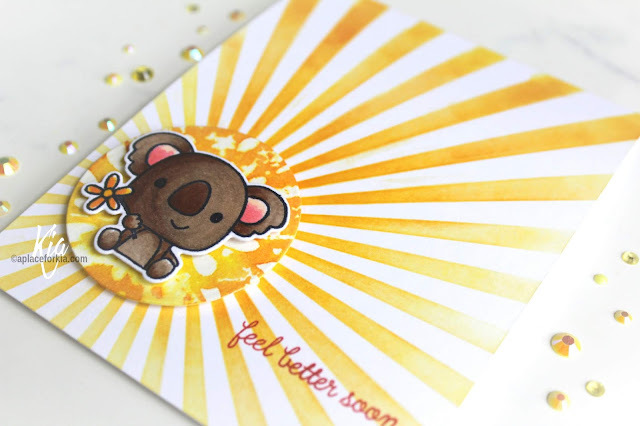 I have also done a video showing this card, shown below. 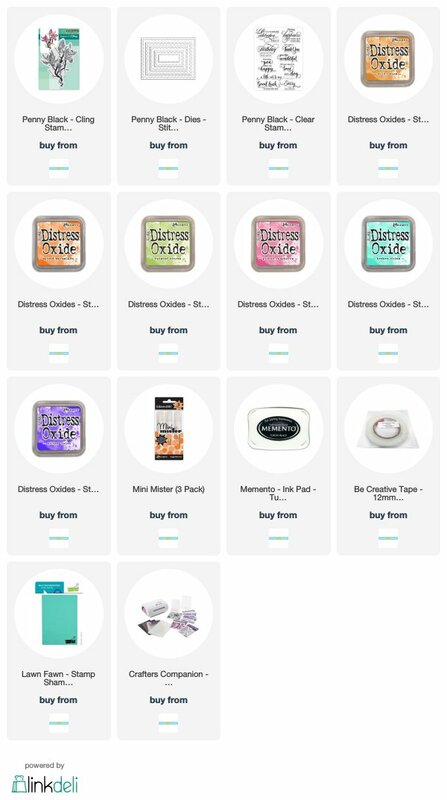 Following are affiliate links to the products I used at no cost to you. Yesterday I shared with you a card I did using Distress Oxide inks and a baby wipe. I did that card on glossy card stock, and today I am sharing with you my card using the same technique, but this is done on Photo paper. 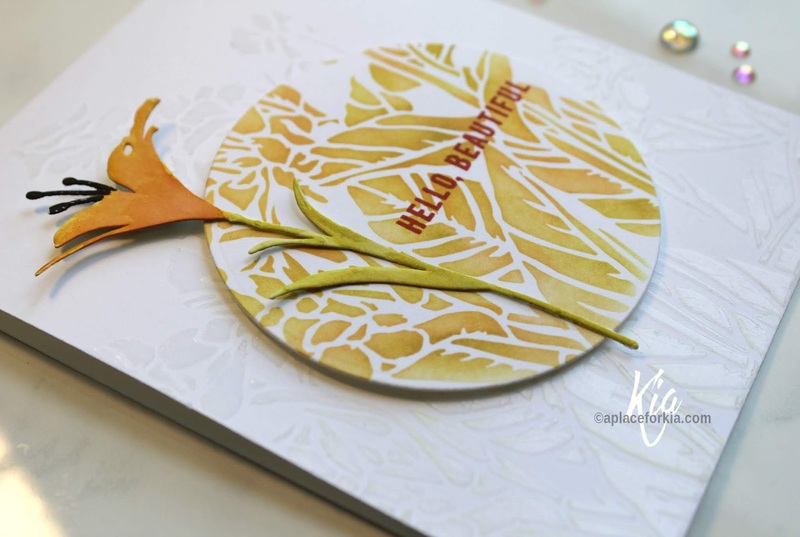 It is thinner than glossy paper, but it produces more radiant colours than on the glossy card stock. But I have to say, I like both of them. Either way, the baby wipes are the trick. 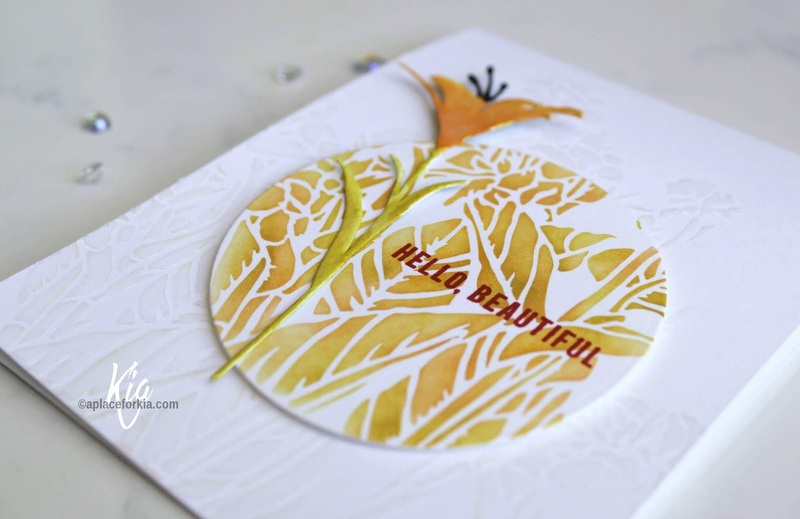 I first die cut my piece using Penny Black's Stitched Stacks die. Starting with my lightest distress oxide inks, being Wild Honey, Spiced Marmalade, Twisted Citron, Picked Raspberry and a tad of Broken China, laying down the colour, spritzing with water and smooshing into the paper and, the most important part, drying between each layer. 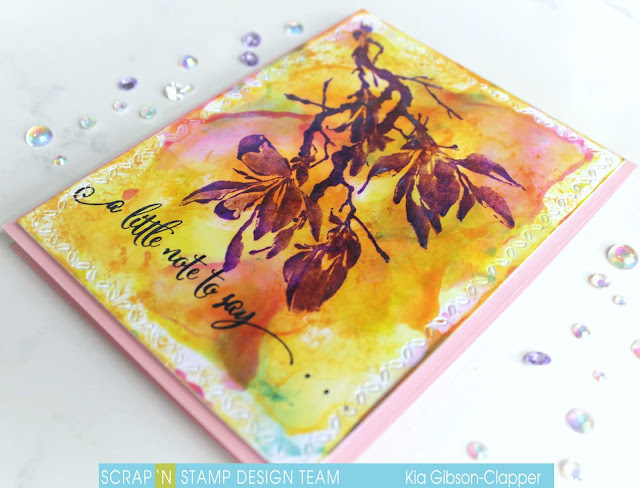 Once I was done with the layers and happy with the outcome, I stamped my flower using Distress Oxide Wilted Violet. 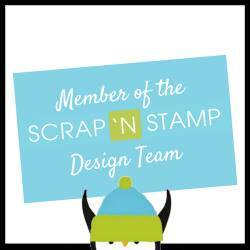 I first did a regular stamp with no water, then on the second stamp I added a spritz of water. I stamped the sentiment using Memento Tuxedo Black ink. The the magic, wiping it down with a baby wipe. The colours just pop, as you can see in this video. I attached my panel to some fun foam with scor-pal tape and attached the panel to a light pink card base. I also like to do the inside of my cards, so I did the background as above on a die cut piece of Photo paper and to bring the violet inside I stamped the sentiment using the Wilted Violet. 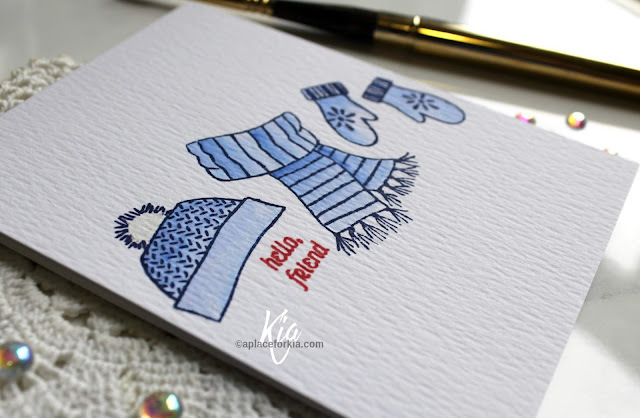 I hope you have enjoyed this card, and I hope you will give this a try. It is fun to be sure. Thank you for dropping by, I will see you next time! 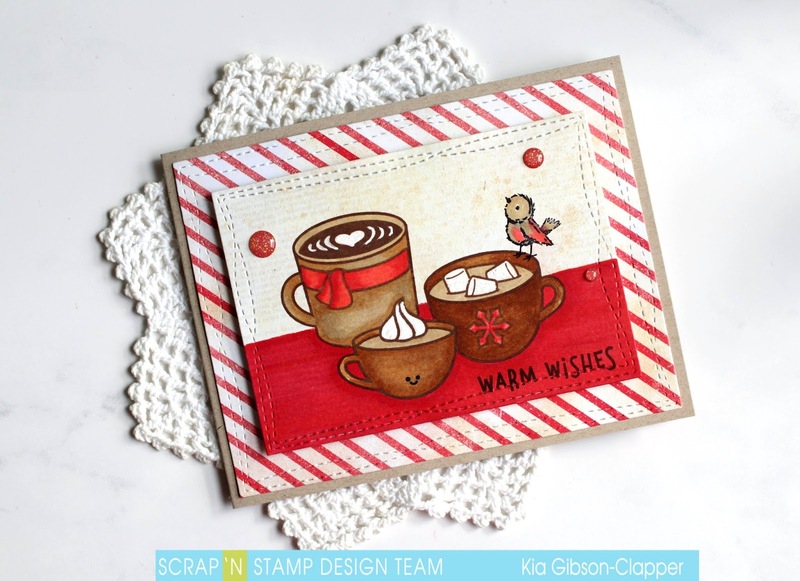 I am posting this card today as part of my post for Wednesday, where I will also be posting on Scrap'n Stamp Canada showing a different card done using this technique. Last week I watched a video on YouTube showing distress inks used on Photo paper, or glossy paper. In this case I used glossy card stock. 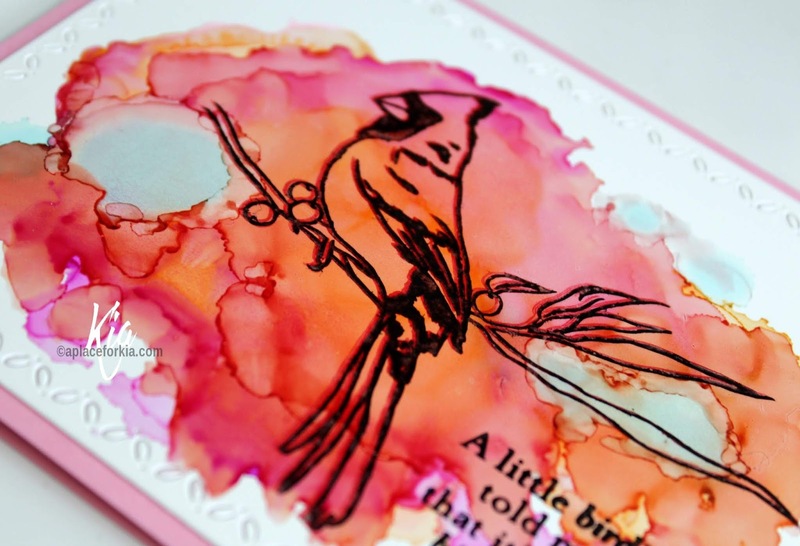 I used my Ranger Alcohol Ink Brushes as they flowed nicely on the glossy card stock, using the brush on its side. The die set that coordinates with the stamps has a die that is for landscaping purposes, and in this case I used it to represent the cliff. 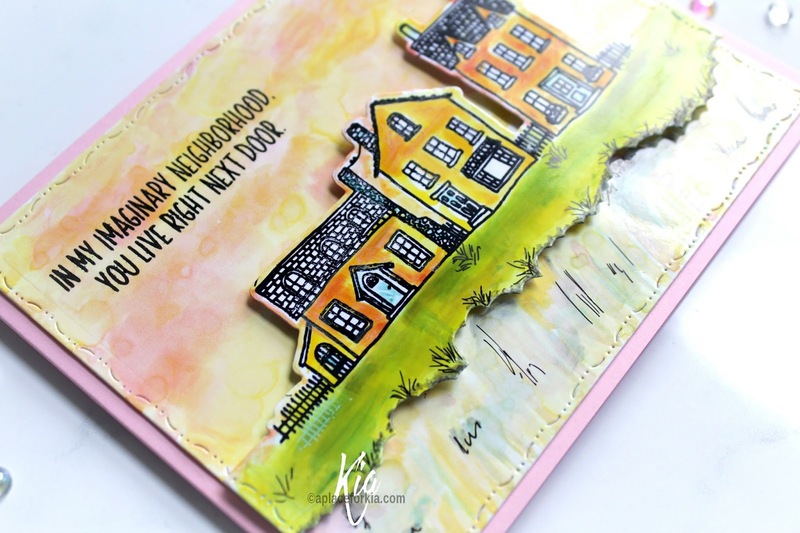 I stamped the houses using Memento Ink. The magic happens when you wipe the entire piece with a baby wipe. These colours are brilliant and wonderful. I used my Micron Pen to do my doodling. 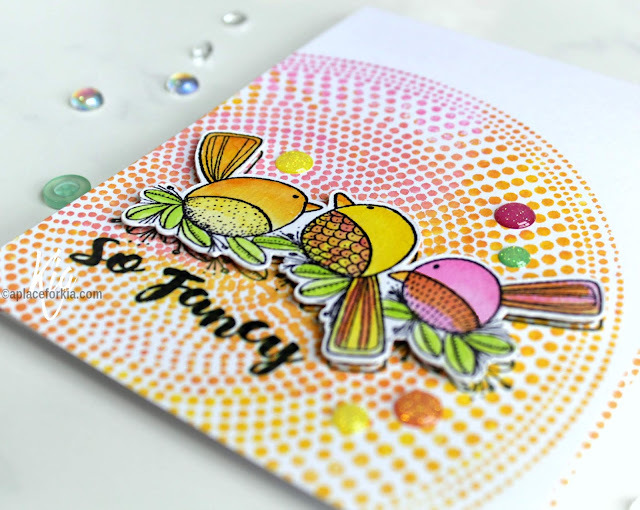 I will have a video on my card that I do for Wednesday showing you how I do that card, which will have some smooshing. 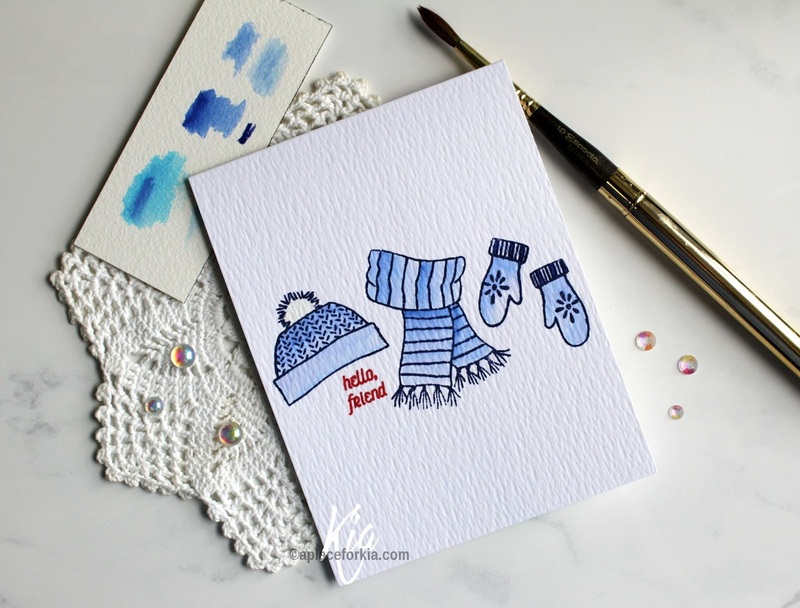 I have provided links to the products I used on this card below, with the USA links first, and beside those the Canadian Links. Thank you for visiting today. I hope you have enjoyed this card. 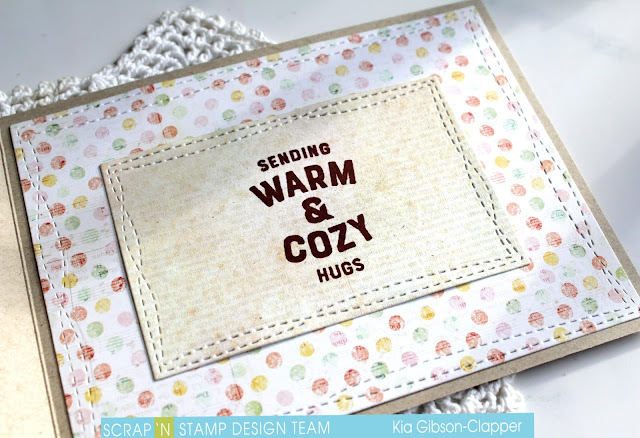 This is my sample card for the Clean and Simple Challenge at Splitcoaststampers with our challenge being Weather Related/Under the Weather. I did the sun rays for the weather, the flower centre for the sun (under the bear), and the bear holding a flower for the feel better. I think I may have coloured my Koala too dark though. Oh dear! 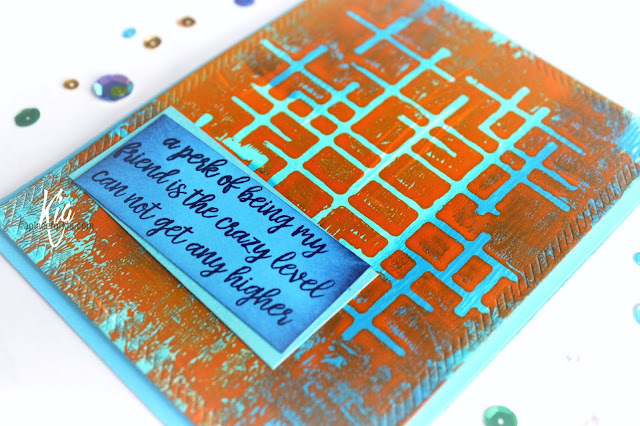 On my card base I sponged on the distress inks for the rays using Mustard Seed and Spiced Marmalade along with my Life Changing Blender Brushes and my MFT stencil. For the sun, I inked up the Loopy Flower Stencil flower centre with the same colours and spritzed with water before laying down on card stock. Once dry, I die cut the piece with the Spellbinders Circle die, then spritzed with my home made Perfect Pearls mix, mixing in a Mini Mister the Perfect Pearls and water. I use a fair amount of Perfect Pearls until the Mister is opaque looking. The sun is sparkly, which you don't see in the pictures. 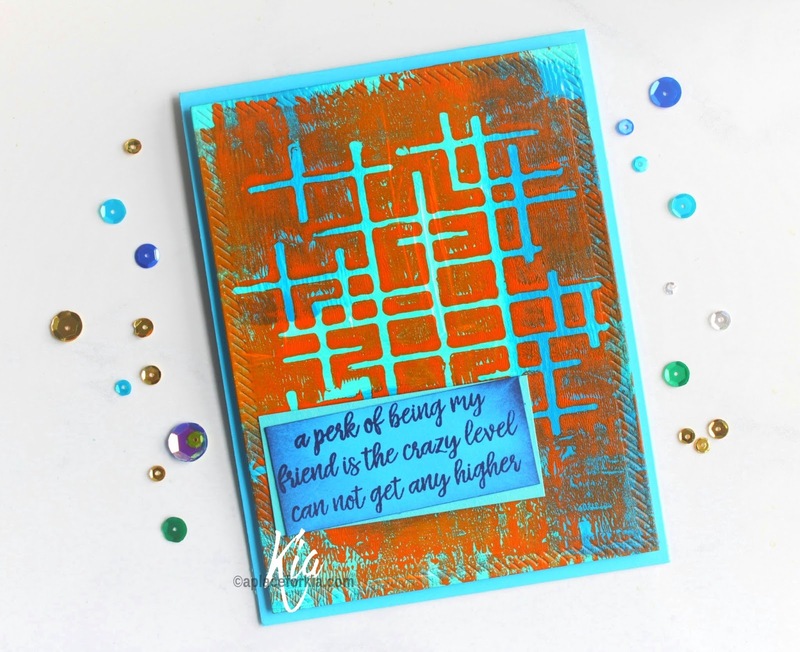 In my Misti I then placed the circle on the card base where it would be and stamped the sentiment using Ranger Archival Ink in Monarch Orange. 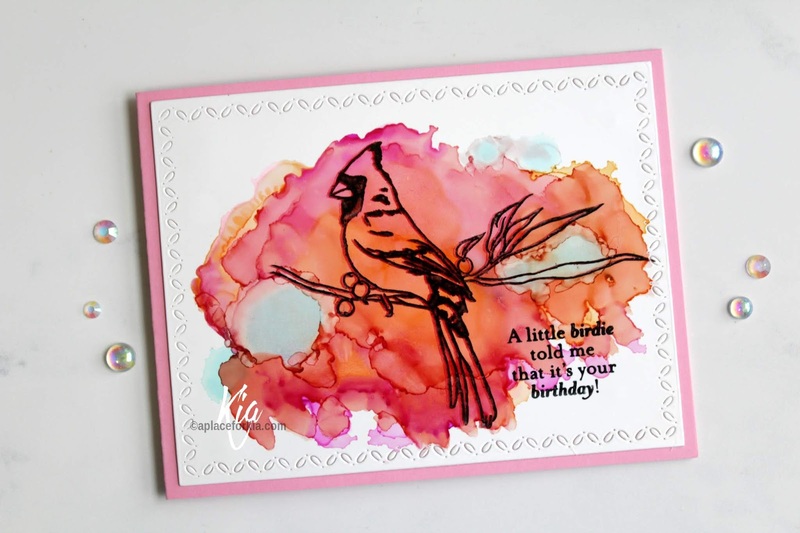 In my Misti I stamped my image, (which is from Reverse Confetti, but no longer available) with Memento Ink, then coloured with Copic Markers. I think I could have done without using the darkest brown Copic. To put it all together I added foam tape to the circle and attached to the card base, then added foam squares to the Koala and attached it to the Sun. It really is cute. 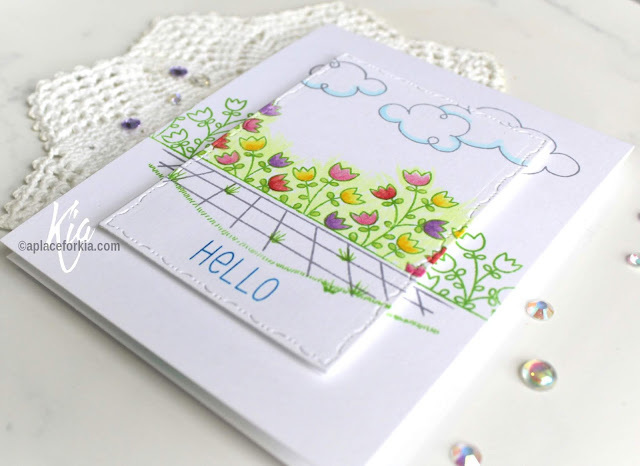 I hope you have enjoyed this card today and wish to thank you for visiting. Hello to you! I am playing along with the Inspiration Challenge at Splitcoaststampers today, where we had a visit to Fine Art America for some inspiration. I picked this fun piece for my inspiration. I did a quick gelli plate background on 32lb photocopy paper, meaning I only made this one piece, using Vicki Boutin Acrylic Paints in Blue Hawaiian and Saltwater Taffy for the background, then stencilled using Orange Slice and an older stencil I have had for a long time from The Crafters Workshop called Crosshatched Frags by Ronda Palazzari. I glued the print to a piece of 110lb card stock as I wanted to have it attached on fun foam. 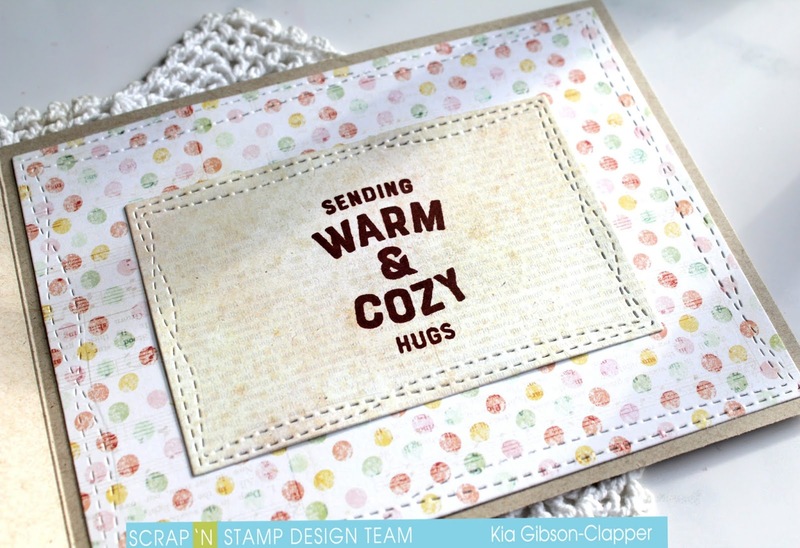 I then die cut the piece using My Favorite Things Inside & Out Diagonal Stitched Rectangle die. I sponged around the edges of the card with Ranger Cobalt Ink so as to not have that dreaded white border. I then went over the entire piece with Judikins Micro Glaze and buffed to a nice finish. 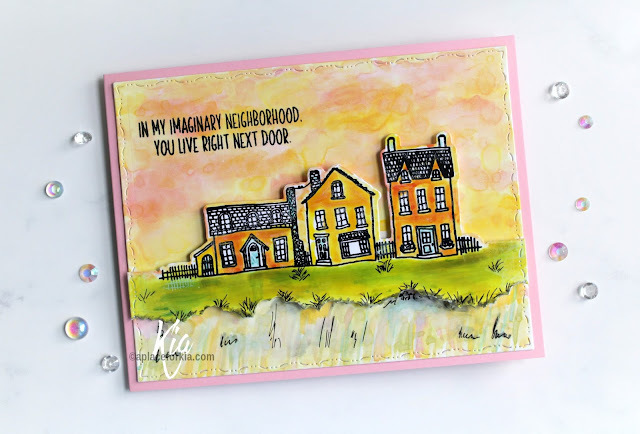 I then stamped the sentiment from Picket Fence Studio using the Cobalt Archival ink and sponged the edges with the same ink. 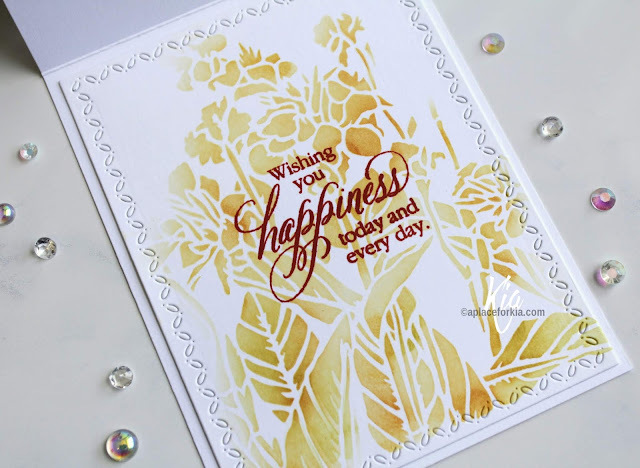 I hope you have enjoyed this card, and thank you for visiting my blog. We have a dull day with freezing rain happening as I write this. Needless to say, it is a dull day, so I brought some sunshine in to my corner by doing this card. 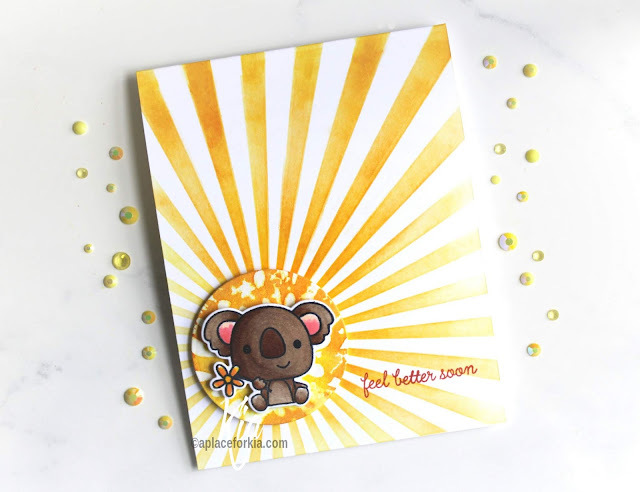 I knew when I sat down at my work space that I wanted to use my Hero Arts Sunburst stamp, as it would be the perfect "sun" background. 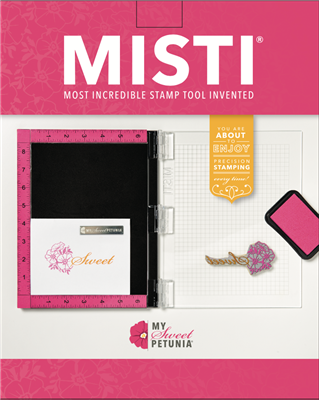 I placed the stamp in my original Misti, along with my folded card base, putting a piece of paper between the layers of the card stock so as to not stamp on the edge of the bottom piece. 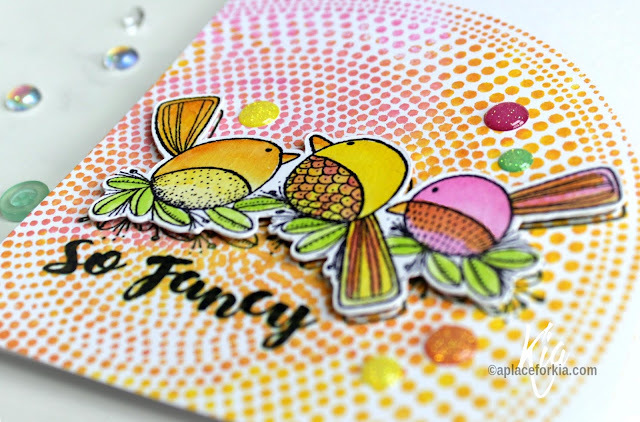 I inked up the stamp with Distress Oxide Inks in Spiced Marmalade, Mustard Seed and Picked Raspberry, spritzed with water and stamped, and yes I was happy with the results. I then proceeded to stamp the birds in my Mini Misti, stamping on Ranger Watercolour paper and using Ranger Archival ink in Vivid Chartreuse. Using Tim Holtz Distress inks in the same colours, being Spiced Marmalade, Picked Raspberry, Mustard Seed adding Twisted Citron for the leaves. I mixed the colours on the birds a bit on the tails and breasts as I water coloured. Once finished and dry I used my Scan'n Cut to cut the birds, as this set does not have a die to it. I then stamped my card base with the image using Ranger Archival ink in Vivid Chartreuse, then stamped the sentiment in the Chartreuse and over stamped with the black. In doing this I find the sentiment does not appear to be so stark. 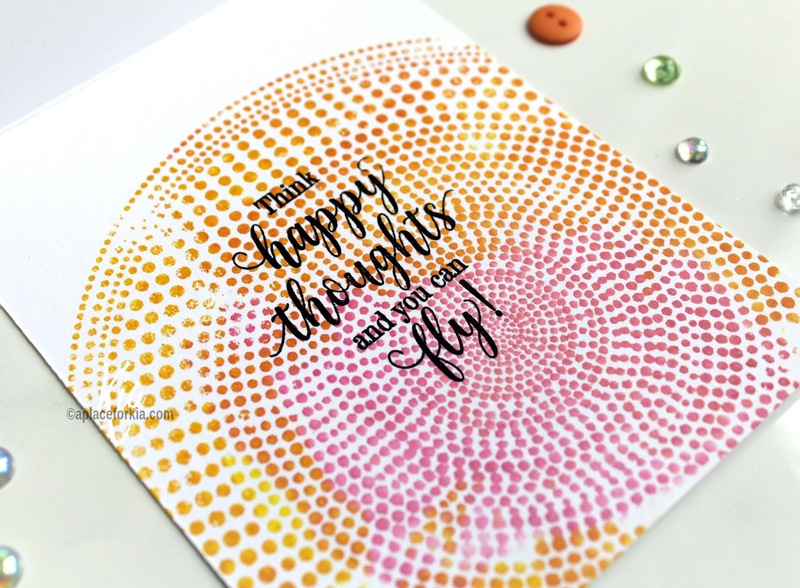 To keep it all flowing I stamped the inside of my card using the same colours, along with the sentiment from Penny Black. This is the first time I have stamped on the actual card base, I normally have an additional piece of card stock attached to the inside, but in this case that would not be pleasing to the eye. I finished my card with a few gumdrops. 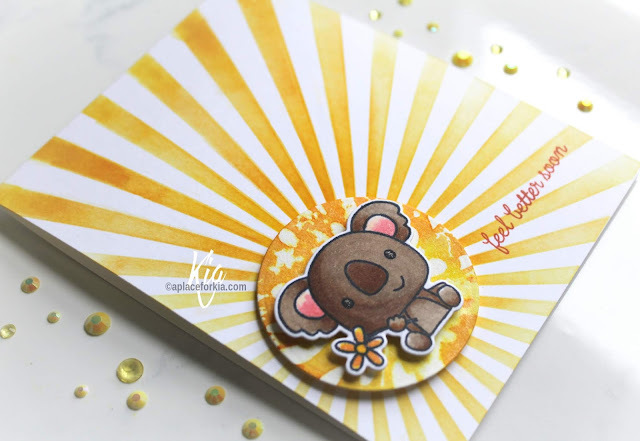 Following is the video I did while making this card. I hope you have enjoyed this card, and wish to thank you for joining me today. Hello to you. This is "Hello Beautiful". I was in the mood to do stencil work, so I hit it twice! 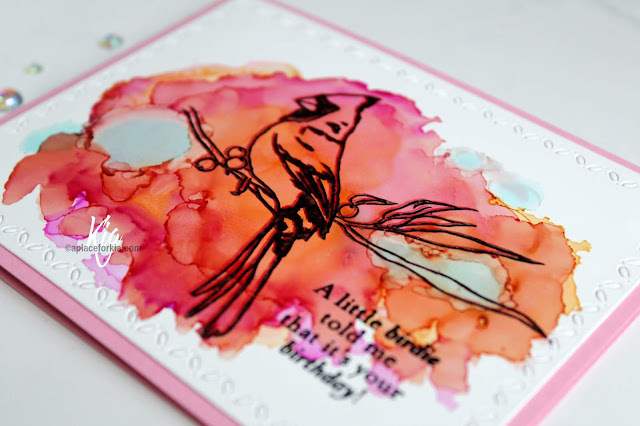 Sponging on colour, and adding embossing paste. 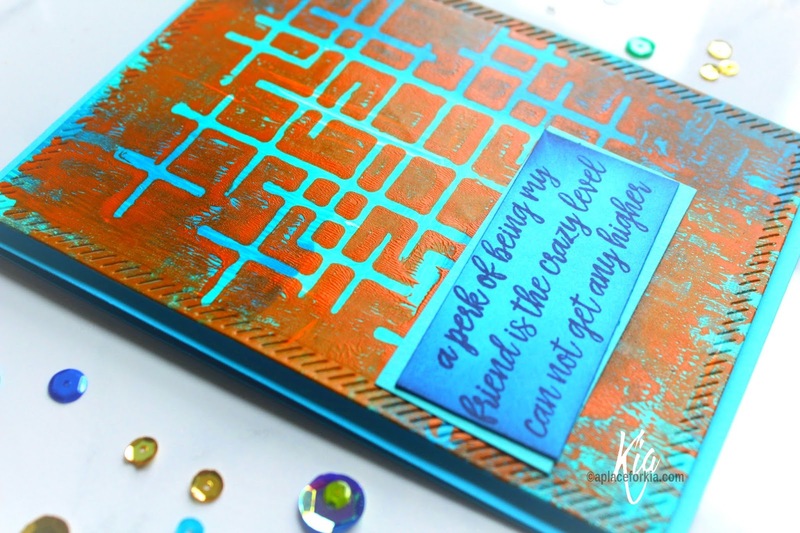 I love the touch of elegant texture the paste adds to my background and the way it makes the sponged stencil work shine. 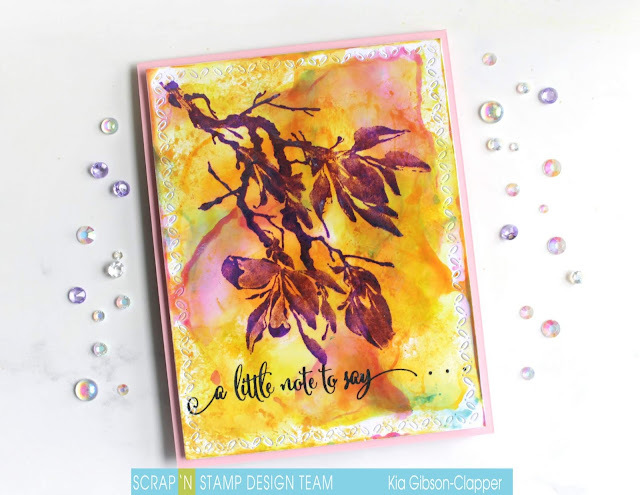 I used Tim Holtz Distress Inks in Fossilized Amber, Spiced Marmalade and Crushed Olive for my sponging, which I also used to watercolour the Wildflower stem. 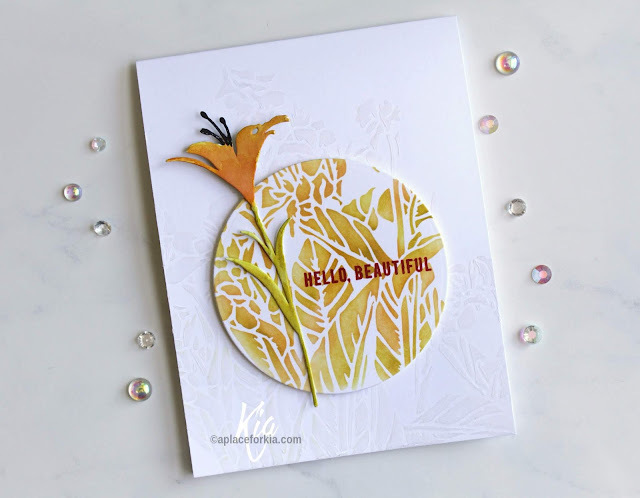 The sentiment is stamped in my Misti using Ranger Archival Ink in Monarch Orange and glued to the circle using Nuvo Adhesive Glue. The Spellbinder Circle die is attached to the card base using foam tape, which adds further dimension to the card. I added some Nuvo Obsidian Black Aqua Pen to the fronds of the flower. For the inside I die cut a panel with my Penny Black Stitched Stackers, and did some further sponging using the same colours, then stamped the Penny Black sentiment using the Ranger Archival Monarch Orange ink. I hope you have enjoyed this card and wish to thank you for visiting today. 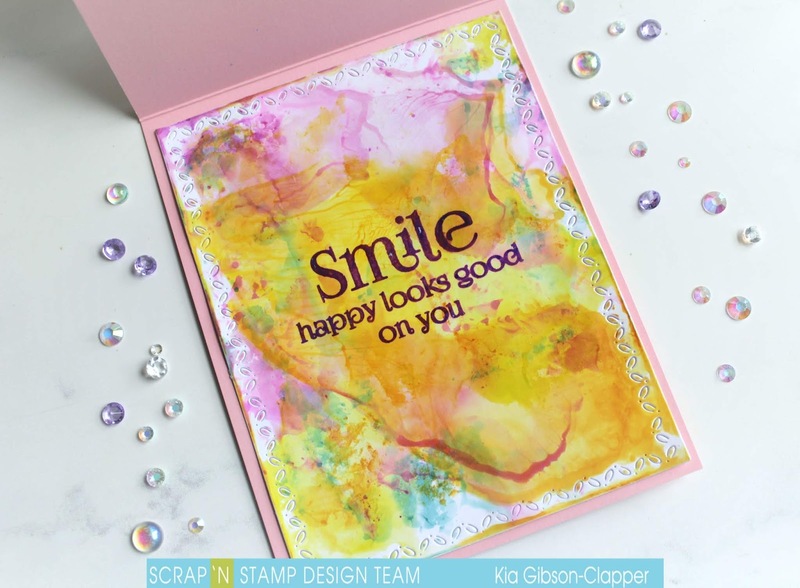 I am hosting the Clean and Simple Challenge this week at Splitcoaststampers where I have asked the participants to use 1/3rd of the card only, and that the card be a single layer. 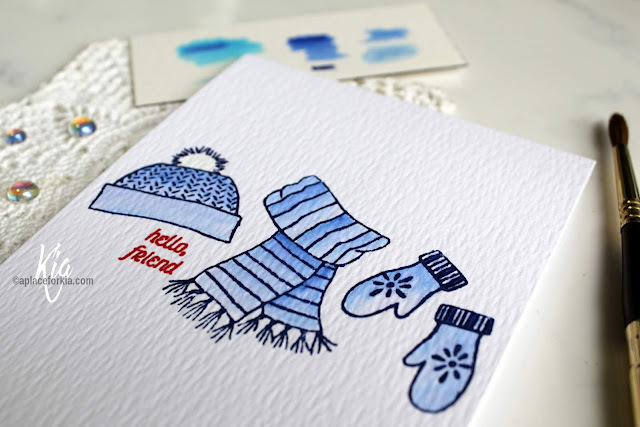 I used the middle of my card, stamping with some Concord & 9th stamps called Winter Wear on Ranger Distress Watercolour Paper, as I wanted the texture. I used the 8 1/2 x 11 size, but the 4.25 x 5.5 could be sued and glued to a card base. I tested a few colours from my Zig Clean Colour Pens, and picked the middle colour, being blue. I stamped the images using Ranger Archival Ink in Cobalt and water coloured using Zig Clean Colour Pens in Blue changing the colours with the amount of water I used. I coloured the fur on the hat using my Uni Posca Paint Pen. To finish, I stamped the sentiment using Ranger Archival Ink in Vermillion, which fits perfectly in the space under the hat. 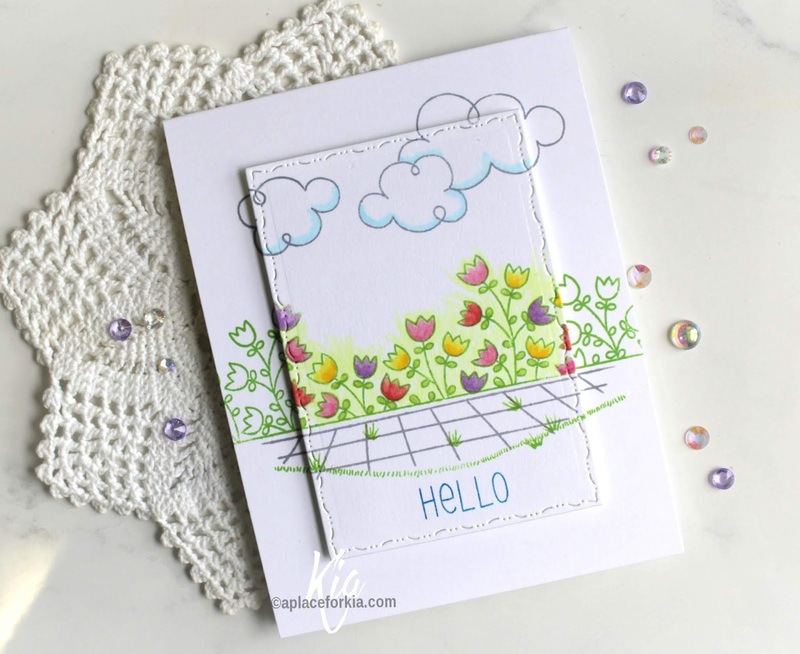 Thanks so much for visiting today, and I hope you have enjoyed this single layer Clean and Simple Card. 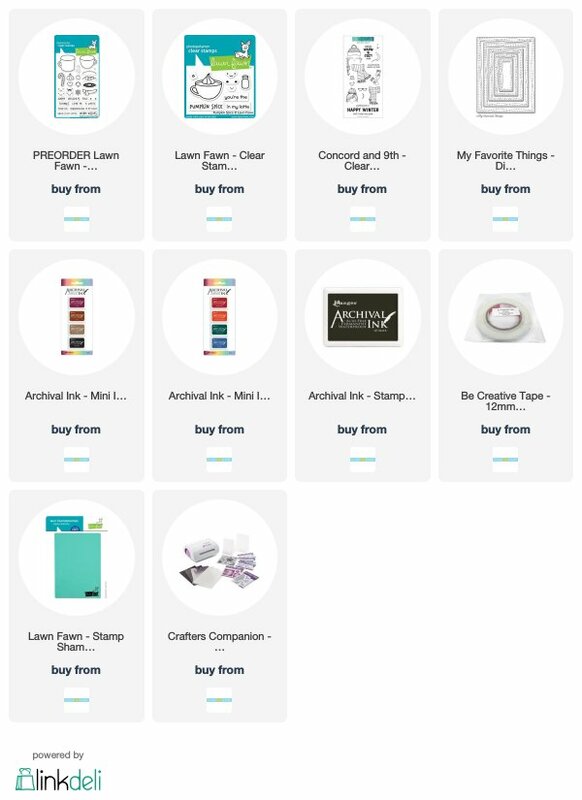 Following are affiliate links for the products I used on this card. I have included the USA links first, then beside them the Canadian Links. But, this is not any bird, this is a Cardinal, and they are by far my favourite bird I think. I have a lot of favourites, but the Cardinal is right up there. And not just the male, who is red, but the female, which is the bird I am representing with this card. 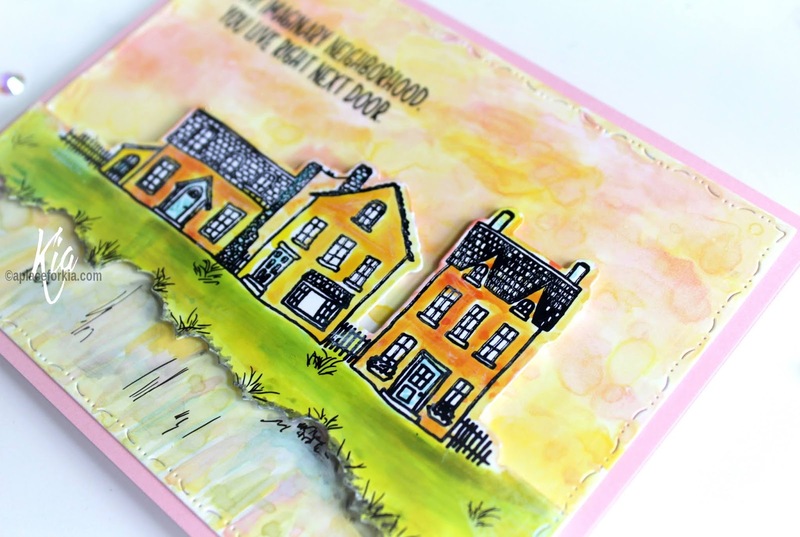 I am also playing along with Splitcoaststampers Inspiration Challenge that took us to the Isle of Wight Studio Glass site. My inspiration came from this Featherspray Fumed Bird. I first die cut my Yupo paper with my stitched stackers die. Doing it afterwards will leave alcohol ink residue on your die, which you can clean with proper cleaner, but that is a step I like to avoid. 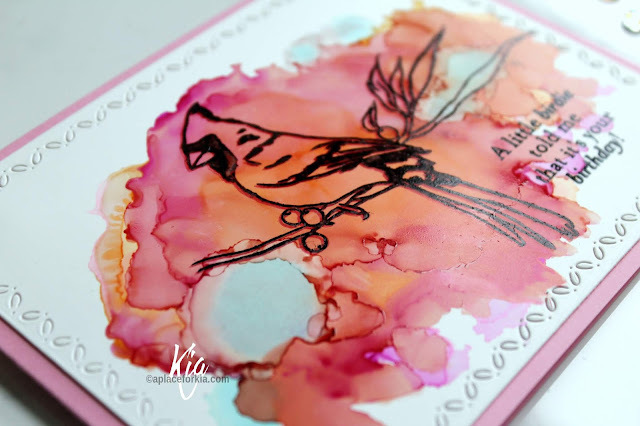 Using alcohol inks I did my background keeping in mind that I would be using this stamp from Gina K. I did not really want to use red, so I decided on the raspberry instead. And as I was using raspberry instead of red, I used aqua instead of greens. 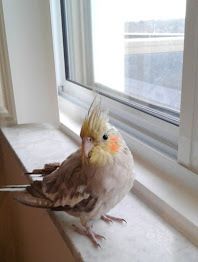 To help with the drying period, I sat my piece on the window ledge with the window open slightly while I cleaned up my work space. It will not dry completely for another 24 hours or so, but I find this helps if I wish to stamp. I put my piece in my Misti, and having it in the corner I stamped using Ranger Archival Ink in Vermillion, giving it several passes. I then moved it slightly, and stamped with Memento Tuxedo Black ink. *A hint. I do not turn my piece over to apply my adhesive. I used Scor-tape, or Be Creative tape and add the pieces while I hold my panel. This way I avoid smudging the black ink, which you will if you turn it over. To finish I attached my panel to a pink background. I thought about black, but everyone uses black ... I dream in colour, so pink it was. I hope you have enjoyed this card today, and very much appreciate your visit. 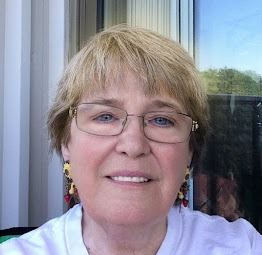 I have attached affiliate links (at no additional cost to you) below which have the USA links first, then beside it, Canadian links. 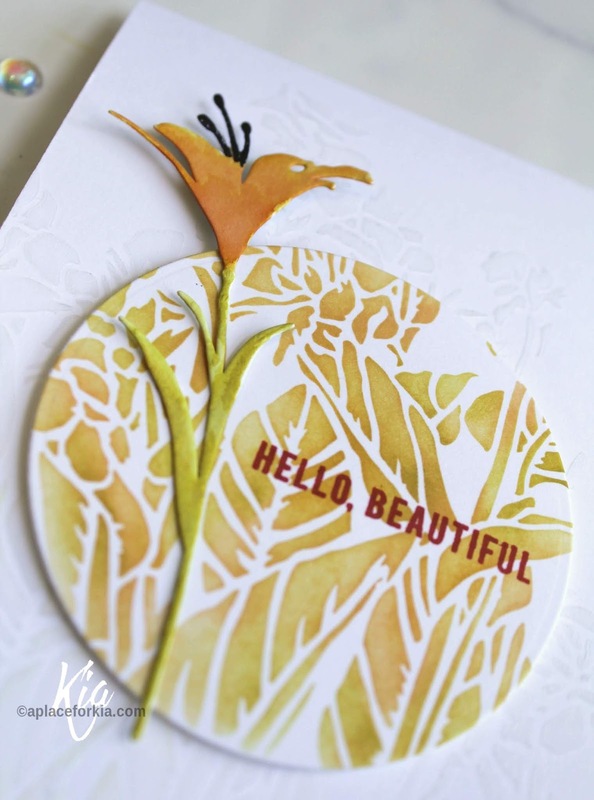 My Canadian site will be bringing in Gina K, but for now I have linked you to a beautiful bird set that I think would work wonderfully with this technique. Welcome to the Scrap'n Stamp "Some Like It Hot" Blog Hop. When we celebrate a hop, we like to include prizes. 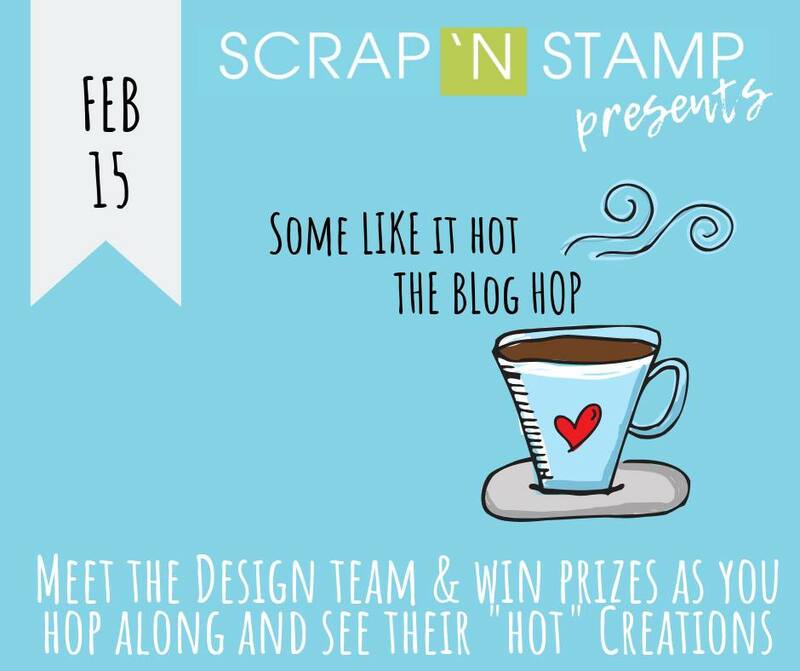 So Scrap'n Stamp will be giving away nine (9) prizes with this hop, plus one lucky winner will win a $50.00 gift certificate to the store. 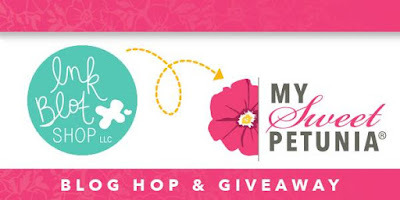 So be sure to hop along with us, and leave some love as you go for your chance to win. Moving on to my card for today's hop. I was going to stamp and colour on Kraft card stock, but then I found these pieces of designer paper from a few years back. 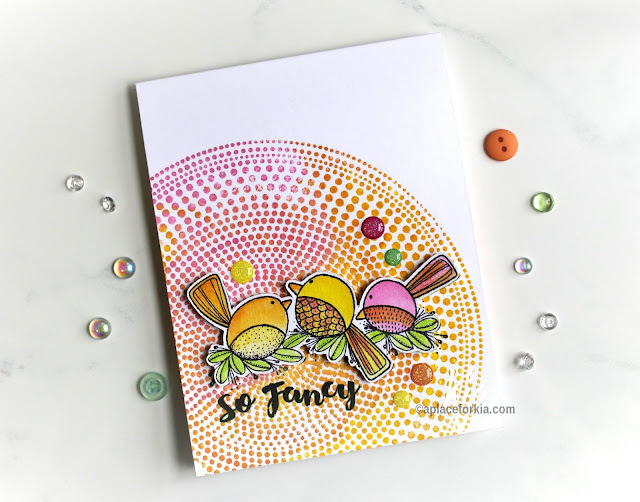 This can be done on any kind of designer paper, but I thought the light print for my stamped panel and the stripe for my background would make for a nice look. I die cut the pieces with my wonky stitched dies. I stamped the mugs using Ranger Archival Ink in Sepia, masking off as I stamped. I then coloured the images using Copics, and coloured the Marshmellows, Cream and Heart Swirl with a Posca Pen Marker. 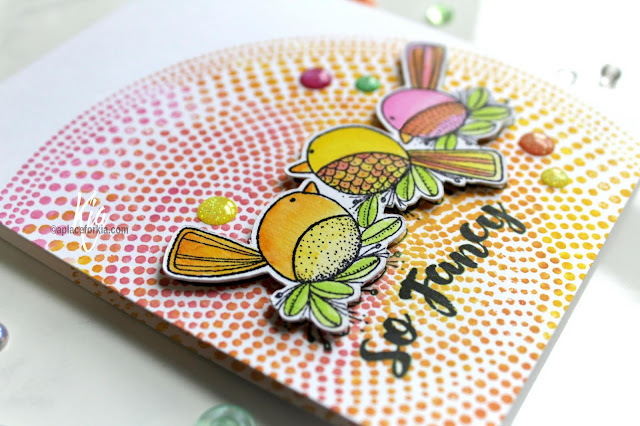 When I was done the colouring, I stamped the little bird, that I could not resist, using Ranger Archival in Jet Black ink, and coloured again using Copics. (The Copic colours I used are E37, E43, E53, R14. R17). I attached the bottom piece to the Kraft card base. 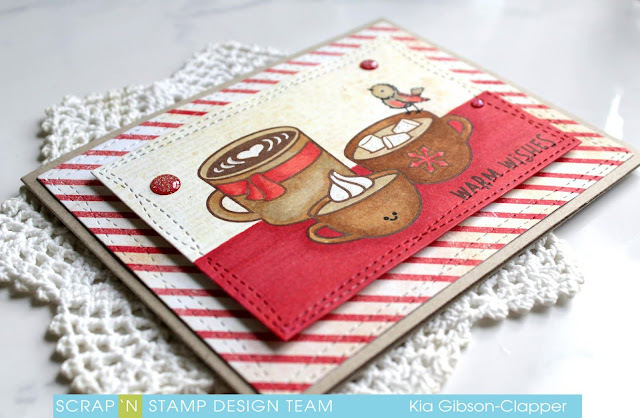 I then attached fun foam to my stamped panel with Be Creative tape, and attached it to the card, adding a few gumdrops to finish. For the inside I again die cut a couple of pieces of the designer paper with my wonky stitched die. 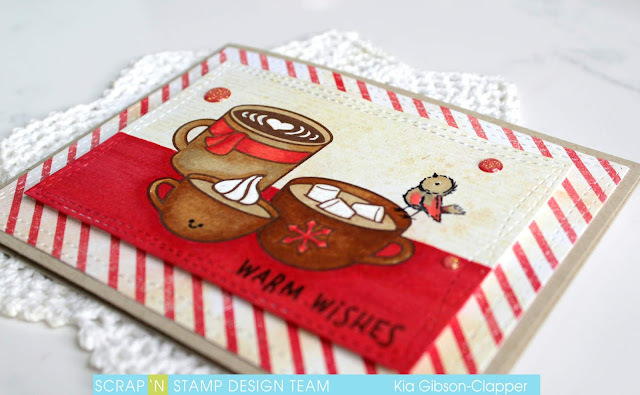 I stamped the smaller panel with my sentiment from Concord & 9th called Winter Wear using the Sepia and Vermilion inks. I have done a video for this card. Following is a list of those participating in today's hop.